First look of Farhan Akhtar's next Movie "Bhaag Milkha Bhaag" released which is Directed by Rakesh Mehra, "Bhaag Milkha Bhaag" is Farhan's first biopic. "Bhaag Milkha Bhaag" is movie on "Milkha Singh" who is an athelte . Farhan Akhtar who had done a hard work for his look and fitness same as "Milkha Singh". He studied on Milkha Singh's Video and Pictures to get the body languague same as athlete. 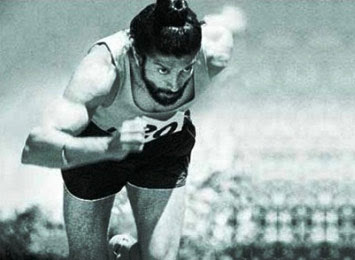 He met Milkha's trainer Havaldar Gurdev Singh to take notes on how he trained the Flying Sikh.